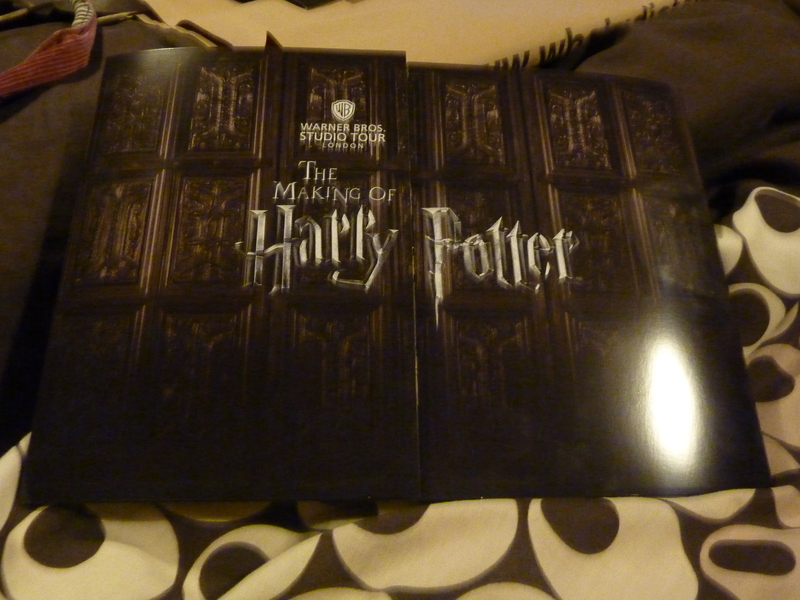 Hi all, this is my second of a series of posts on my visit to ‘The Making of Harry Potter – Warner Brothers Studio Tour’ on 9th April 2012. 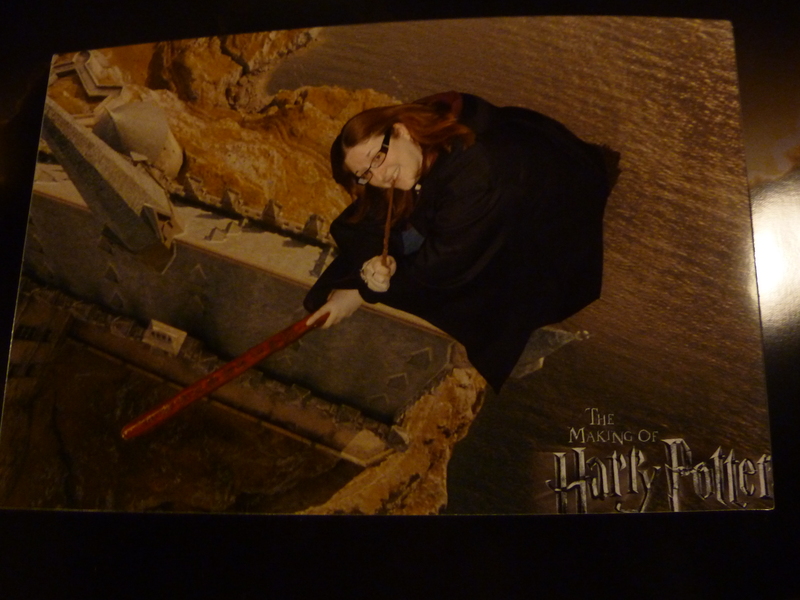 The geeky highlight of the tour for me was getting to ride a broomstick against a greenscreen. I had taken my Hermione replica wand to use for this very photo opportunity. When we spotted this (on the first Soundstage, J [the other is K!] so if you want to do this don’t leave because you can’t get back in again) the queue markers reported it was an hour wait. I think in the end it was about 45 minutes but because you can see everyone else’s turn on TV screens and everyone is so happy to be there it really didn’t feel that long. There are two ‘stops’ in this queue – flying in the Ford Anglia (well sitting on green boxes which seems to seat 4 comfortably). One of you gets to drive if you can coordinate your hands with the steering wheel on the screen in front of you and everyone gets to scream and sway as the Hogwart’s Express comes up behind you. Then they take a snapshot (with warning so you can pose). You get given a ticket with your photo number on it for if you want to purchase it. Then you are back in the queue for a short while. If you don’t arrive in robes (I will next time ;o)) you are loaned a set for the broomstick ride. They only seemed to be available in Gryffindor colours for adults, and as a Pottermore sorted Hufflepuff I felt a little disloyal to my house. I spotted Hufflepuff robes for kids though (but no Slytherin or Ravenclaw here) – one kid got asked if she minded being a Hufflepuff – minded. Harumf. There are 3 broomsticks and if you are with someone it’s much more fun to watch each other. My sister went first. Then came my turn. Wand in hand I climbed into the upturned plate type seat and put my feet in the ‘stirrups’, grasped the broomstick firmly between my hands and acted to the scene on the screen in front of me. Putting my embarrassment aside I (to the laughs of some young girls) proceeded to sway side to side and shoot my wand over my shoulder, complete with shoop noises. Yes, I know, but as I said to the girls, you kind of have to don’t you. Don’t you? At the end of your ride (and it isn’t that long but I still think it’s worth it) they take two pictures, one face on which they superimpose on a variety of backgrounds, and one aerial shot. For both my sister and I the aerial shot was the most flattering and the staff member complemented my casual swishing wand motion. Photo prices were 1 for £12, 2 for £15, 3 for £18 and 4 for £20 and any after that were £5. Sadly there is no video footage of your ride but the photographs all come in a presentation frame. Come back for future posts where I’ll share more hints and tips about how to get the most from your experience. Including my Top Photo Opportunities post. Posted on April 11, 2012, in Kirsty rambles on about life, the universe, tv, and everything!, Reviews and tagged Broomstick, Geek, Harry Potter, The Making of Harry Potter, Wand, Warner Brothers Studio Tour. Bookmark the permalink. 2 Comments. Waaaaaaaaaaaaaaaaah S’Not Fair ……… wanna go! Lovely though – thanks so much for sharing! Book it. You will love it I’m sure.